Its 2019 and as the future continues to roll out in front of us both things and people continue to change. Music, fashion and even the look and needs of the automotive world have continued to transform. Ford knows this hence the recent release of the 2019 Ford EcoSport. While most “old school” SUVs are what many now consider large mom machines or hefty duty off-roaders, the newest version of the sport utility vehicle now takes what most enjoy about the average American sedan and combines it with what continues to be popular in the SUV market. Currently taking the Gen Z world by storm the all-new Ford EcoSport is a subcompact SUV that offers tons of versatility both inside and out, added cargo space despite its small stature, reduced fuel consumption and added technology features that make this small but mighty Ford model one that young adults are sure to continue jumping behind the wheel of. Available in four available models, including the S, SE, SES and Titanium trim levels, each of these Ford SUVs come well-equipped with plenty of power and capability as well as award-winning features. Along with 16-in alloy wheels and a capless fuel filler, the most basic models of this 2019 MotorTrend SUV of the Year Contender also offers heated outboard mirrors, remote keyless entry, two 12-volt outlets and USB ports and a rearview camera. This vehicle, along with most of the EcoSport models are all powered by a turbocharged 1.0-liter EcoBoost engine that is capable of 123 HP and 125 lb.-ft. of torque. Stepping up to the SE model gives all those fun-loving millennials a chance to enjoy a power sunroof, dual-zone climate control, Ford’s SYNC 3 infotainment system with a 6.5-in touchscreen as well as Apple CarPlay/Android Auto integration. The Titanium model also includes all these features as well as rain-sensing wipers, a self-dimming rearview mirror, a heated steering wheel and a 10-speaker 675-watt B&O Harman upgraded sound system. For those who prefer a small but mighty subcompact SUV with a bit more power and capability, should check out the luxurious SES Ford EcoSport model, which is powered by a 2.0-liter engine that is partnered with an All-Wheel Drive transmission that can handle sudden changes in weather or road surface. A sportier suspension setup and steering-wheel-mounted paddle shifters can also make tackling those curvy roads with friends more like competing in Formula 1. Despite all the fun options listed in each of these Ford EcoSport models this Ford model continues to keep both the owners and passengers safe and sound thanks to features like traction control, 4-wheel anti-lock disc brakes and Blind-spot monitoring with rear cross-traffic alert. This fun, stylish yet safe Ford vehicle also received four out of five stars in recent government crash tests. 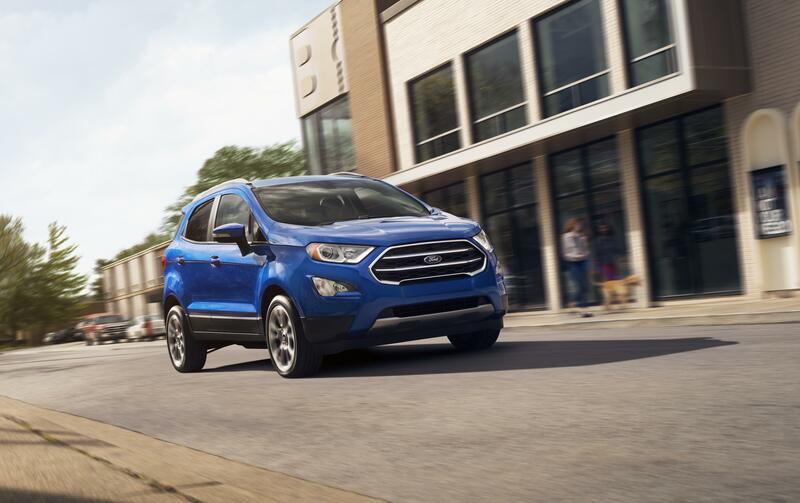 If you are ready to check out the subcompact Ford SUV that will leave you feeling younger than ever get to your Southern California Ford Dealers to begin the first step to each new adventure ahead.